Kitchener has a population of around 210,000. It’s located in between Goldfinger Law's London office, and our Toronto office. The City of Kitchener sits next to the City of Waterloo, and is often referred to as the Kitchener-Waterloo area. Just to the south of Kitchener sits the City of Cambridge Ontario. Together, Kitchener, Waterloo and Cambridge are known as the tri-city area. Kitchener has a large German population. It used to be called Berlin from 1855-1916. Imagine that. An Ontario town called Berlin. Kitchener has a more blue collar reputation that it’s neighbouring City of Waterloo. Waterloo hosts two universities (Waterloo & Laurier) and is more of a college town. Kitchener had employed a number of large manufacturing and processing plants. Maple Leaf Food operates a packing plant in Kitchener, which used to be Schneider’s Foods. Budd Canada used to operate an auto parts manufacturing facility in Kitchener, but the plant closed down in around 2009. Unfortunately for Kitchener, two other large manufacturing employers Kaufman Shoes and Electrohome also closed down their operations in Kitchener as well. There’s no doubt that Kitchener has seen some difficult times. Kitchener is the home to the largest Oktoberfest celebration outside of Germany. The Toronto Raptors also conduct their training camp out of Kitchener, making it a popular tourist attracting for basketball fans. Car accident and brain injury victims in and around the Kitchener area can be treated at one of the three local hospitals which include the Grand River Hospital, St. Mary’s General Hospital and Cambridge Memorial Hospital. Goldfinger Law has visited car accident and boating accident victims at all three hospitals. They all offer superior care for accident victims from in and around the Kitchener area. Regrettably, there is a shortage of family doctors for the Kitchener area, which is a concern to local politicians. It also prevents accident victims from getting the care which they need following their discharge from hospital following a devastating car accident. Goldfinger Law has assisted many accident victims from the Kitchener area in finding a suitable family doctor following their car accident. 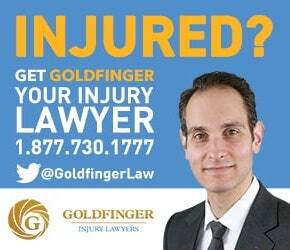 If you or a loved one has been hurt of injured in an accident in Kitchener or the surrounding area, contact Goldfinger Law today for your free consultation with one of our personal injury lawyers. We would be pleased to assist you any way that we can with your personal injury or long term disability case. All of our consultations are free and confidential. All of our consultations take place with a personal injury lawyer and not an accident consultant. Call us today at 1-877-730-1777.